On 27.November 2006 the Cantonal Court in Sarajevo declared Novo Rajak, a Bosnian Serb reserve police officer to 14 years in prison for war crimes against Bosniaks in Visegrad during the 1992-95 Aggression. The court convicted Novo Rajak, 41, of crimes against the Bosniak population of the Visegrad area in eastern Bosnia-Herzegovina during the early years of the Genocide. These included the expulsion of Muslim residents from their homes and the destruction of their property. The court also found him guilty of a role in atrocities against Muslim civilians, some of whom disappeared after Serbs captured the enclave of Zepa in 1995. 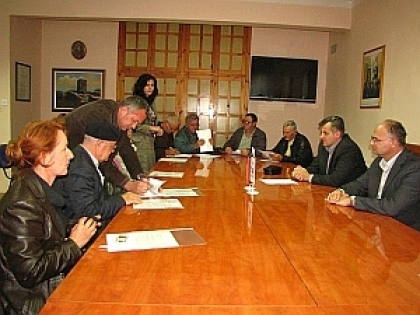 On 13.10.2011. the Visegrad Municipality signed contracts with 11 families for the reconstruction of their houses. Five of the families were Bosniaks and the rest Serbs. The project is financed by the State Ministry for Human Rights and Refugees. One of the persons who signed the contract is the wife of war criminal Novo Rajak. Rajak is currently in prison serving his sentence for war crimes committed against Bosnian Muslims during the Genocide 1992-1995. Image: The signing of the contracts in the Visegrad Municipality. Novo Rajak, sentenced for war crimes committed against Bosniaks in Visegrad.